Enter in your mobile phone number or e-mail address and we will notify you when City Nav South America MicroSD is back in stock. City Navigator South America provides detailed road maps and points of interest for your Garmin device, so you can navigate turn by turn to the destination of your choice. This map is provided on microSD card (with SD sleve) so just plug it into your compatible Garmin GPS and you're ready to navigate South America! Coverage includes more than 2 million km (1.3 million mi) of roads throughout the 7 countries and Florida. Countries include: Argentina, Brazil, Chile, Colombia, Uruguay, Venezuela as well as Florida in the U.S. and full coverage of the French Guiana. City Navigator brings you the most detailed street maps available so you can navigate with exact, turn-by-turn directions to any address or intersection. You can also route to over 31,000 Points Of Interest such as restaurants, lodging, attractions, petrol stations, shopping and more. Also includes detailed information such as turn restrictions, roundabout guidance, speed categories and other navigation features. 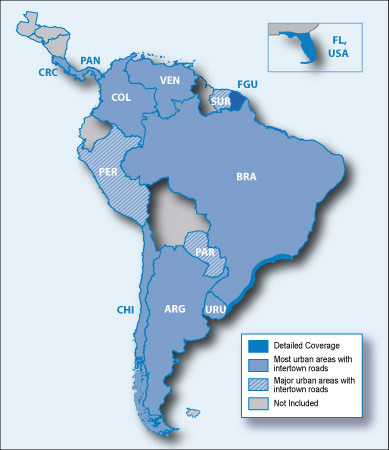 Major urban areas with intertown roads coverage of Paraguay, Republic of Peru and Suriname. Used this card in my Zumo 660 on my rented motorcycle for the trip from Santiago, Chile to Ushuaia, Argentina and back again. Worked quite well. Pretty much up to date on locations. To find hotels, etc., it works best to have a postal code. Street names from a map do not necessarily show up that way in the GPS. Just input the last of the street name and the GPS will figure out whether you are looking for an avenue or street, or some other form of the way the road is called. Also addresses that you want, may not show up. Always know the street intersections for last resort locations of addresses. Not that I am a great GPS user, but it works pretty much the same way as my other Garmin maps. Pros: Easily installed and worked right away. No setup required. Cons: Took a while to figure out the street naming protocols. Just returned from 1 month motorcycle ride through Argentina and Chile. With my Sth America maps SD card firmly in my Garmin 62s I never got lost in extremely unfamiliar territory. Highly recommended.